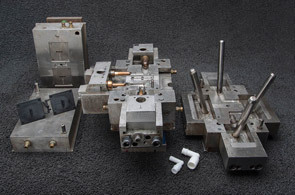 Petersen Molding Corporation is a leading Los Angeles California based manufacturer of injection molded plastics including precision injection molded products, parts and components. Fabricated in different plastics, resins, engineered resins and commodity resins with custom specific blended color concentrates, additives, UV stabilizers and flame retardants. Petersen is a family operation that was established in 1942, with more than seven decades in business, Petersen Molding provides exceptional service and superior quality that your company can depend on. We are proud to have three generations continuing our legacy of superior quality products and exceptional service. With more than seven decades in business, we take pride in our ability to perform "all" your plastic injection molding needs. And, of course, all of our products and parts are proudly made in the U.S.A.
From start to finish, Petersen Molding has the experience and capacity to complete your project. From long runs to medium and short runs, we deliver results efficiently and on time. Our experience and expertise are evident in every part that we produce. Our highly trained staff of production specialists accepts nothing less than absolute quality as they guide your project through design, development, manufacturing, and finally shipping. Find out how Petersen Molding can help save your company time and money while delivering superior quality parts. © Copyright 2017 Petersen Molding Corporation. All rights reserved.